[tps_footer]Priyanka Chopra has finally returned to India after the completion of her American series Quantico. The gorgeous star Priyanka is ruling the Bollywood industry currently with her back to back excellent performances. Priyanka Chopra has not only earned laurels in the tinsel town but has also generated a huge fan following in the Hollywood front. Recently, Priyanka sported the character of Kashibai in the film ‘Bajirao Mastani’; the diva stole all the cake with her mesmerizing acting skills in the movie. After gaining all the applauds for the film ‘Bajirao Mastani’, Priyanka is now ready with her rough and tough look for the film ‘Jai Gangaajal’. Shedding away her girly and fashion image, Priyanka Chopra is nailing her intense side in the trailer of the film. The trailer of the film ‘Jai Gangaajal’ has already made its way to the audience and is gripping to the core. Playing the role of inspector Abha Mathur, Piggy Chops is looking realistic as ever in the trailer. The film ‘Jai Gangaajal’ is a sequel to the film ‘Gangaajal’ which starred Ajay Devgn. The actress will be seen donning the role of a strict police officer specifically a SP who has landed in the city to wipe off the crime. The sensitive film is directed by Prakash Jha who is credited for making political centric movies. Prakash Jha is a brilliant story-teller. That’s something we all knew. Looks like he can act well too. #JaiGangaajal is looking fab. #JaiGangaajal is already a hit with it’s trailer. @priyankachopra those fierce eyes and spotless acting curves generate some serious power! 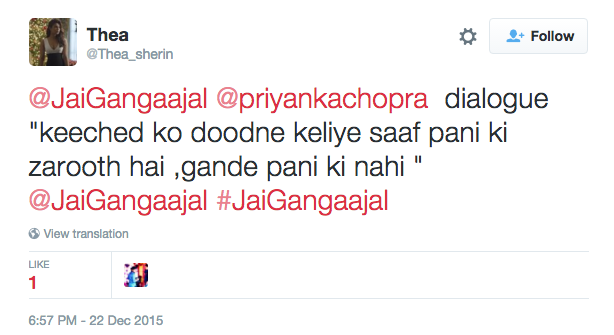 @priyankachopra watched the trailer of #JaiGangaaJal.. Amazing it is.. 4th March.. Date is booked.. Surely gonna watch it. You nailed it..
#JaiGangaajal looks like a female reboot of Ajay Devgan’s cult hit #Gangaajal. That’s it. But ya @priyankachopra looks smashing in it! Previous articlePhotos: Farhan Akhtar And Aditi Rao Hydari Promote Wazir!